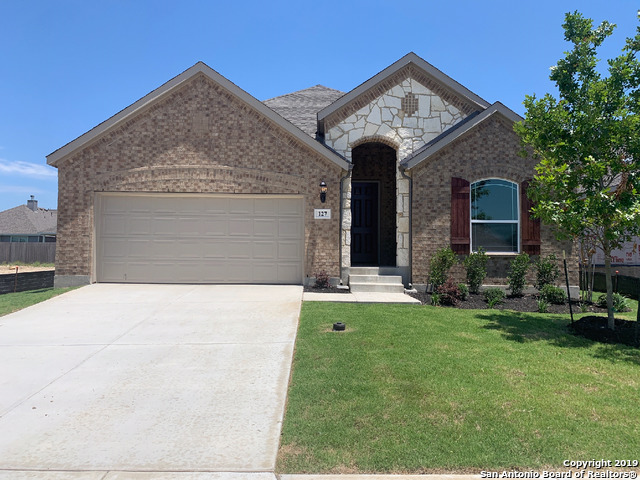 All CHAMPION HEIGHTS - KENDAL homes currently listed for sale in Boerne as of 04/25/2019 are shown below. You can change the search criteria at any time by pressing the 'Change Search' button below. "You need to see the homesite. Its HUGE! This home is a3,016SF 1.5 story with large bonus/gameroom. The plan has 3 bedrooms with 2 full baths. Large covered patio outside overlooking an enormous back yard; with a stone and brick exterior. Inside, large open plan huge kitchen and breakfast area, large bay window in Master. Nice corner fireplace. This plan includes a 3 car tandem garage with a storage bay! Full landscaping with sprinkler system and wrought iron fence. View includes spring-fed pond"
"Villanova - This home is a 2939 SF single story, 4 bedrooms with 3 full baths. A great covered patio outside with a stone and brick exterior. Inside, this plan offers a large open plan, huge kitchen with upgraded cabinets with upgrade Granite counter tops. and breakfast area, fireplace and a 3 car garage. Full landscaping with sprinkler system on a 80X145 large lot and 8 foot privacy fence in the back yard!" 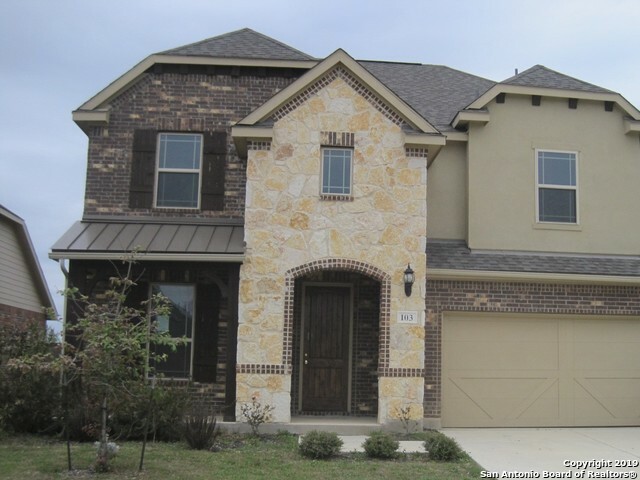 "Custom 3 bed 2 bath home plus office in beautiful Boerne. Experience the grand entry and high ceilings which lead you into the Dining Room and large island Kitchen overlooking the spacious Living Room. Kitchen boasts beautiful granite counters, gas cooking, breakfast area and extended bar seating. Private Master Suite overlooks sparkling swimming pool and offers a separate vanity, walk-in shower, garden tub and huge closet. Enjoy the inviting covered patio and pool out back!" "This is special, limited time pricing. See Sales Counselor for detailsThis is a GREAT one story on an 89x145 lot size with 8ft privacy fence in the back on a quiet cul-de-sac street. 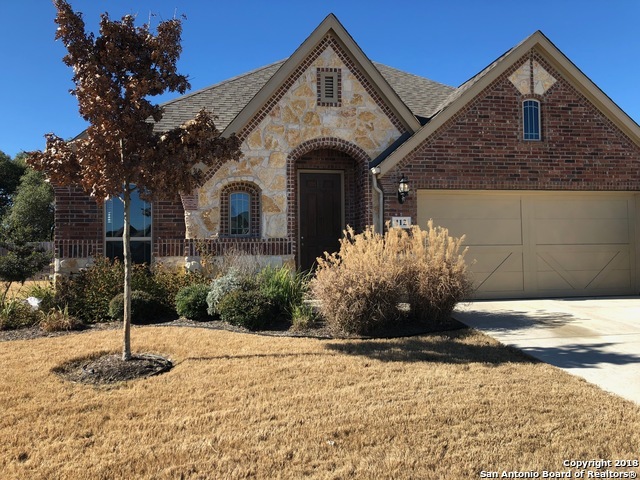 This home has an array of upgrades including upgraded kitchen appliance package with two ovens, Omegastone, upgraded cabinets and back splash, wood floors and upgraded tile and beautiful stone fireplace. Come and see this beautiful home today." "This is special, limited time pricing. See Sales Counselor for detailsThis is a unique Rear-Entry single story on a corner lot. Great Floor plan with over 2700 sq ft, 4 bedroom 2.5 bath with a formal dining and a gameroom. Oversized patio, pre-plumb for water softner and beautiful bay window in the master bedroom." "Lovely home with Greenbelt/Seasonal Creek/Walking trails with wrought iron fencing. 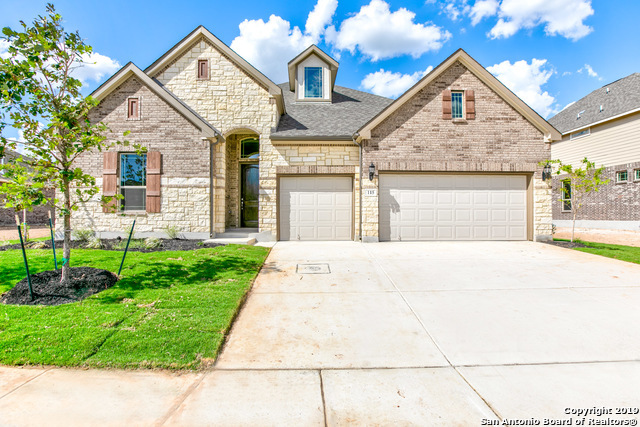 This Move in Ready Home has 4 bedrooms, 2 1/2 baths, Game Room, Media Room, Loft and Covered Patio & Large fire-pit. Sought after Boerne ISD. Access to Boerne Lake. Close to IH10, shopping." 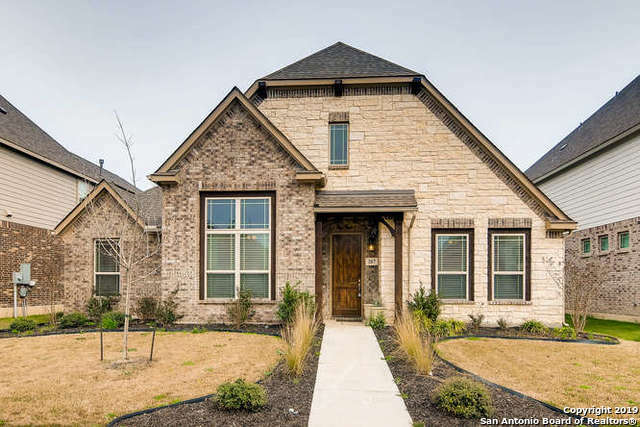 "Magnolia-This home is a 4 bedroom, 3.5 bath home with Master downstairs. Open family room with kitchen and breakfast. Wood floors in main living area; tile master bath. Separate tub and shower, dual vanities. 42 cabinets in Kitchen with Granite countertops. Gas range, microwave and dishwasher. Upstairs 3 bedrooms with 2 baths and large gameroom! Huge covered patio in backyard." 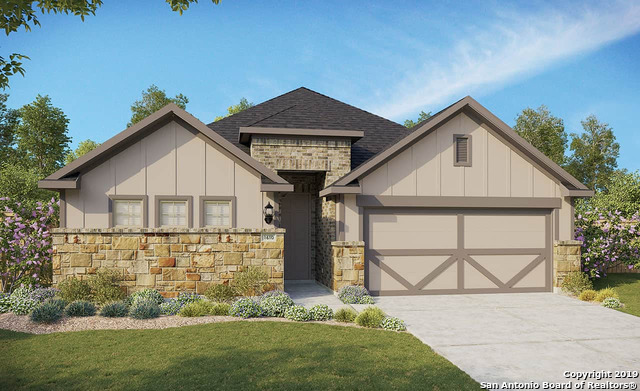 "Juniper - This is the largest one story in the Premier series; 4 bedrooms with 3 full baths. Two separate secondary bedroom areas for guests! Gameroom included. Large windows in Master and Family; separate tub and shower with separate vanities. Main living includes high quality decorative vinyl plank and carpet flooring in bedrooms. Large lot with full irrigation system and landscaping. MUST SEE!" "WOW!! 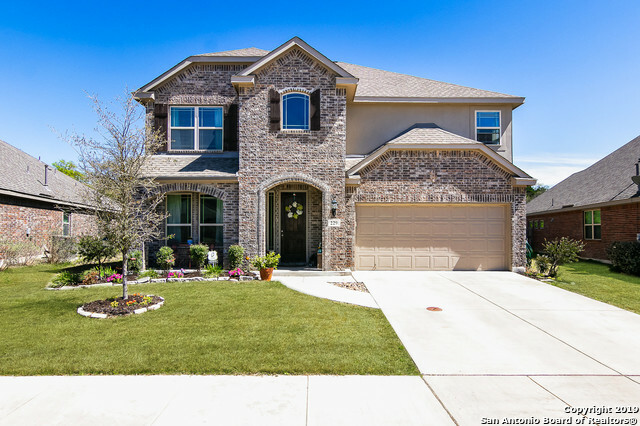 CHECK OUT THE PRICE on this LARGE and GORGEOUS 4 Bedroom 3.5 Bath Home! Boerne School District!! 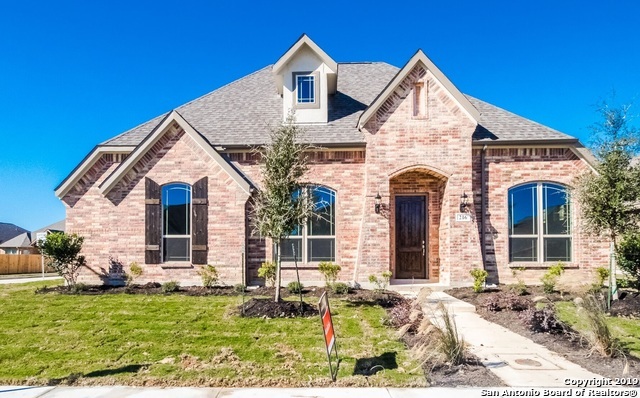 Priced well below the New Homes in the neighborhood! Pretty Looking exterior! Lots of Space! Master Bedroom Down! Game Room/Media Room however you wish to use the space. Large secondary bedrooms! High Ceilings! Hurry this home has a bid deadline very soon!!" "Welcome Home to a beautiful 1 story in Champion Heights. on a cul de sac. Like new, upgrades include cabinets, granite, 9ft ceilings, water softener, water sprinkler, home security and ipad on back porch to listen to music. The huge, almost 1/2 acre lot, backs up a greenbelt with beautiful majestic oaks. Cul de sac so little traffic. 3 bedroom plus a study with a built in murphy bed for an extra bedroom if needed. Bonus room for dining, media or another living area. Tile throughout. Huge kitchen"
"Beech - This home is a 1610 SF single story with split private master bedroom. Large open living room, kitchen and breakfast. 3 bedrooms, 2 baths. Large master bath with separate tub and shower and huge walk-in closet. Wood floors throughout main living area with carpet in bedrooms. Oversized covered patio. Large back yard!"